My Old Kentucky Blog: N.E.R.D....out! 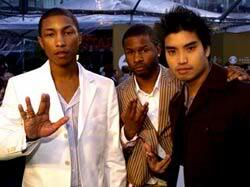 Despite their acronymic claim that "No One Ever Really Dies," the genre-bending trio N.E.R.D.-- Pharrrell Williams, Chad Hugo, and Shay-- have broken up due to a label dispute. Soundgenerator reports that singer Pharrell Williams recently spoke to BBC Radio 1's Jo Whiley, declaring, "N.E.R.D. is dead. I don't agree with the management at Virgin Records so we're done." The exact nature of the dispute remains unclear but fear not, the Neptunes production team will remain intact-- future collaborations are scheduled with Rosco P. Coldchain, FAM-LAY, Vanessa Marquez, Clipse, Slim Thug, N.O.R.E., Beanie Sigel, Mariah Carey, P. Diddy, Mary J. Blige, and Omarion. Shay will go back to doing whatever it was he did in the first place. About the state of the Neptunes and the possible future of N.E.R.D., Williams told Whiley: "Me and Chad still do what we do in the studio, Shay is still our best friend, you know, perhaps we'll do some music for our fans and leak it to the Internet or something, who knows? I've been very quiet about it for the last two years. I'm not here to slander or throw dirt, I'm just not happy so therefore N.E.R.D. is expired." N.E.R.D. released two albums, In Search Of... (which was issued twice-- once with typical Neptunes production stylings and once recorded with a live band), and Fly or Die. Serving as a departure from their hitmaking production duties for the likes of Jay-Z, Nelly, No Doubt, and Kelis, N.E.R.D. had relatively few hits and allowed Williams and Hugo to explore their pocket-protector leanings through live instrumentation, Beatlesque psychedelia, new wave, and references to outer space.